“Ouchie!” is every parent’s least favourite word. 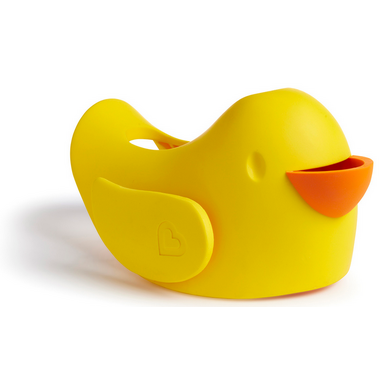 Protect your little one from bath time bumps and burns with this snug-fitting spout guard. With an adjustable strap, this spout guard fits to most faucets and protects your little one’s head from bumps or burns. And when you need to turn the showerhead on, you don't have to remove Beak™. The open-top design gives you access to the diverter at all times. There's even a bubble bath dispenser for sudsy fun. 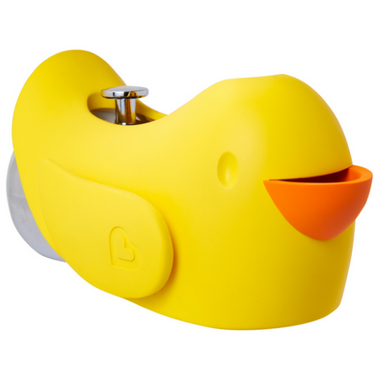 So if you want to ensure your little one’s safety and let the good times flow, Beak™ is sure to fit the bill! Made of durable material and no paint, which means you do not need to worry about chipping! Bought this because my daughter likes to move around in the tub. Unfortunately, the duck doesn't stay on the spout and continually slides off. Our youngest girl is extremely wiggly and this ducky has protected her head from a bad bonk more than once. We've been using it for about a month now and my only complaint is that it has loosened up a bit over time but it's still staying on well.